PHOENIX — More details have been released in the case of two missing children from the Belton area who were found in the semi-truck of a Florida man in Arizona. The children, who were reported missing on March 15, were found in the sleeper cab of a semi-truck in Winslow, Arizona, 75 miles east of Flagstaff. The two were being held against their will by suspect Marshall Pendergrass, 47. On March 16, the Winslow Police Department with help of the Navajo County Sherriff's Office made contact with Pendergrass at the 400 block of Transcon Lane. The two found were a 12-year-old boy and 14-year-old girl, who are siblings and not related to Pendergrass. The children were turned over to Arizona Department of Child Services where they are reported to be in good physical condition. The children told officials that they had been bound with duct tape and zip ties. According to official documents, Pendergrass had been a neighbor to the children and their family when they lived in Florida. Pendergrass had been in contact with the children and had told them he would be in the area during the children's spring break. 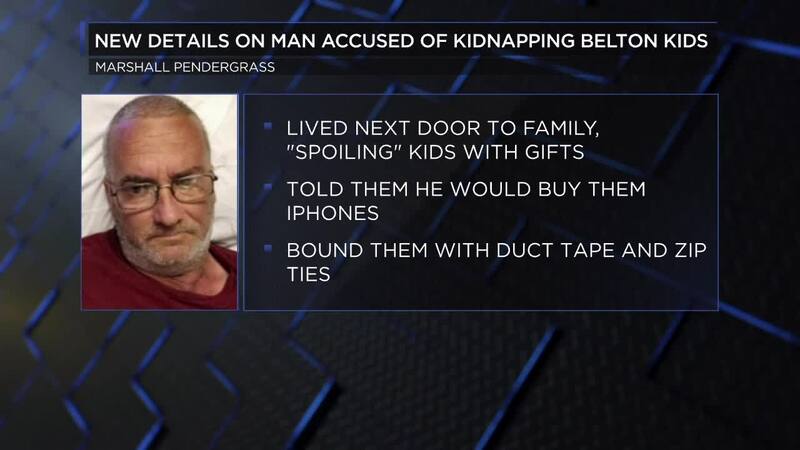 The children told officials that they had communicated with Pendergrass through Instagram and believed that he was going to buy them iPhones, as he had previously "spoiled" the children. After the children met up with Pendergrass, they got into his truck and believed they were going to get their new phones. After driving for a while, the children asked Pendergrass to take them home. According to the document, Pendergrass told them that they weren't going home but with him to Nevada. According to children in the complaint, Pendergrass had said that taking the children was "revenge" after a rumor had circulated that he had "raped" the 14-year-old back when they lived in Florida. The complaint said that Pendergrass had gotten the teen a vape, to which she was caught with and rumors had circulated that he had assaulted her. In his interview with agents, Pendergrass told them that he met up with the children and that they had "talked [him] into letting them ride with him" to Nevada. He denied promising them anything and had planned on taking them home. Pendergrass is currently facing federal kidnapping charges.